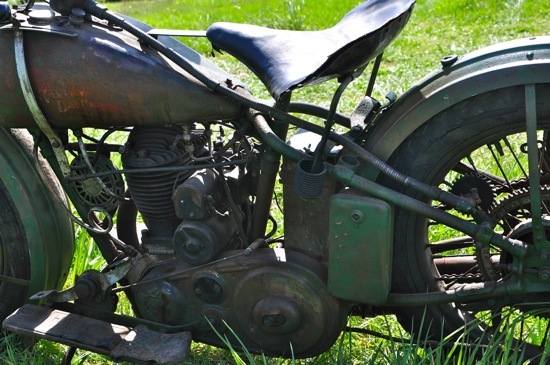 Smoke and Throttle: Barn Find: 1932 32c Harley Davidson Side Valve Single! 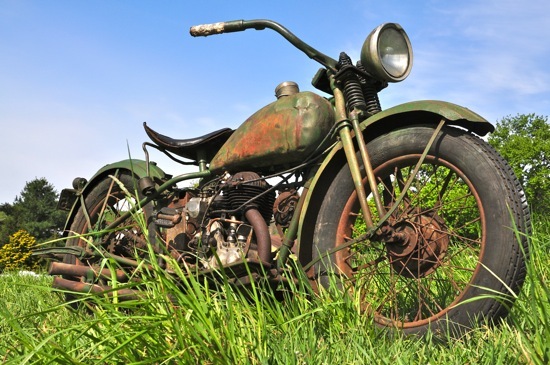 When New York State EMT, AHRMA Racer and cabinet maker Randy Hoffman got a visit from a neighbor asking him if he was interested in an "old motorcycle" her family was trying to sell, he had no idea what to expect. Old is a relative term, especially when one doesn't know anything about cycles, so this barn-bike could've been an 80's Honda for all Randy knew, but like any collector, he eagerly went over to see what they had for sale. Inside the rustic old shed in Eastern Long Island, Randy was shocked to find an old relic of a pre-war side valve thumper. 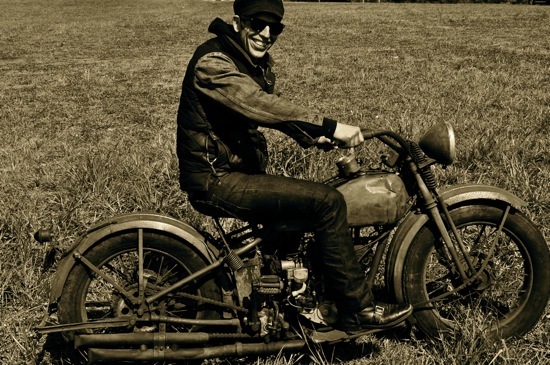 "It's a Harley Davidson" He told the grand daughter of the bikes original owner. "How can you tell?" she asked, bewildered and slightly impressed; "It says so on the tank!" 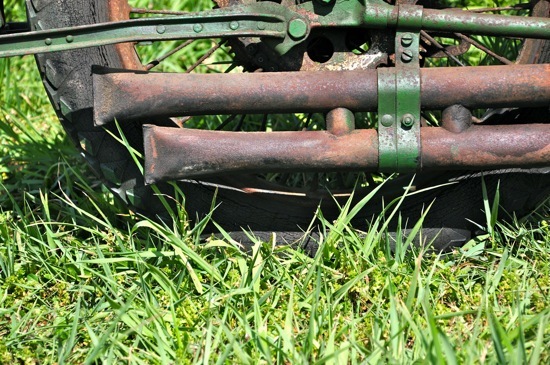 Sure enough, the old bike, which at some point had been painted John Dear green, had the faint remnants of the original HD artwork. 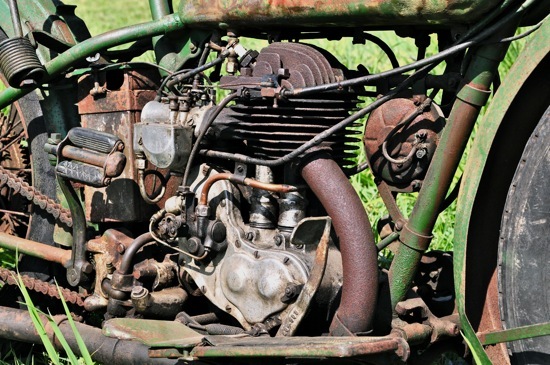 "I had never seen one like it so I didn't even know what was a fair price to offer" Randy recalled at this years Oley, PA - AMCA swap meet, but to be fair to the family, he researched it and found out that it was a relatively obscure and somewhat unpopular model versus the v twins of the same era. "I made what I thought was a reasonable offer and they accepted". 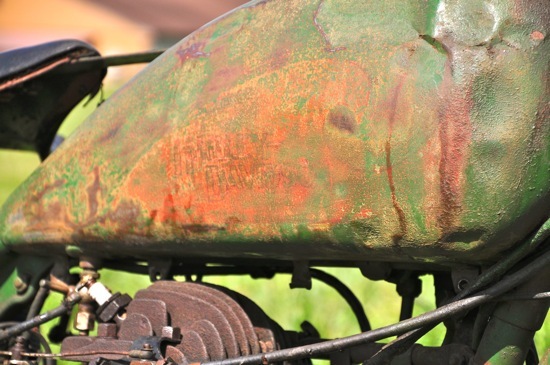 The bike was all original except the paint, though it had been done prior to 1945 (the last year the bike was registered before being parked) so it seemed appropriate to leave it as it tells so much of the bikes days as a farm vehicle in the once rural town of Wainscott, NY. 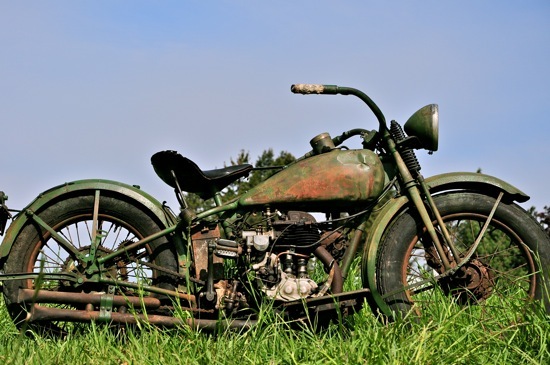 The Harley Singles were re introduced to the Harley line in 1926 (previous single being available until 1918). The new, beefier one-lungs were available in both 350 and 500cc as well as a small run of overhead valve machines, designed for competition. The production runs were small as most of the market wanted the larger V-twin models and the singles were ultimately discontinued in 1934. The ohv did do pretty well on the racing circuit though, as they were much lighter than the twins. Original paint is listed as Olive Drab, though the over spray indicates this was touched up. Faint but there: the Harley Davidson insignia. The single pipe splits in the rear with two balance pipes. 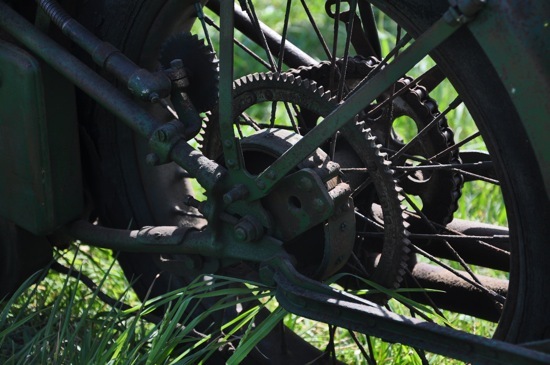 The add-on speedo was driven by this gear attached to the spokes! 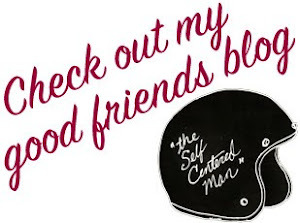 Couldn't resist - better than a boardwalk "vaudeville photo"
2012 Gratz Flat Track Reunion.